Jerry Seinfeld once said that a washing machine was like the night club for clothes. I always think of that quote when we have frittatas. Why? Well, frittatas are kind of like the nightclub for vegetables, right? It can get a bit stuffy in the crisper drawer, so its inhabitants need to get out and live a little. Vegetables, fresh herbs, and in this case fungi, each get all primped and pampered, rinsed, peeled, chopped, cleaned up and ready for a night on the town to mingle with the other cleaned up vegetables. They get to dance and sauté and bake together in a cheesy egg mixture. And a good time is had by all. Preheat oven to 325. In a 10-inch ovenproof skillet over medium heat, sauté the leek in butter and olive oil until soft. Increase the heat to medium-high and add the asparagus and mushrooms. Sauté for 3 minutes. Meanwhile, boil some water (I tend to do this in the microwave) and wilt the spinach leaves. Wring dry, being sure to get rid of the excess moisture. Chop the leaves, and add the spinach to the rest of the vegetables and sprinkle with a bit of salt and pepper. In a large bowl, whisk eggs, egg whites, 1 cup Fontina cheese, 1/8 cup Parmesan, seasonings, and the fresh herbs. Add to sauté pan, sprinkle with remaining cheeses, and bake for about 35 minutes until edges are golden brown and eggs are set. I sometimes serve this with a quickly assembled sauce of jarred pizza sauce mixed with some red pepper sauce like Frank’s Red Hot Sauce. Just mix together, heat, and serve. Haha! I love your comparison about the night club, awesome. This looks super tasty! I love frittatas, they are such a quick and delicious week night dinner. Yes! Great analogy. :D Cheese, spinach, and asparagus...I'd love to go clubbing with that trio. :D This looks amazing! I love the frittatas... and the fact that you referenced Jerry Seinfeld in this post! This sounds amazing! You've included all my favs, spinach, cremini mushrooms, asparagus - and the seasonings look perfect! Great analogy in reference to the night club! I do like to put a lot of goodies in my frittatas. Your recipe here does look like you made some delicious choices with ingredients. Your version is well worth a try-yum! Frittatas are my go to dish when I don't prepare in advance. They're so easy and with all the cheese...so good! LOL! Nightclub for veggies! Love it! And I would love to have this fritatta on my plate! YUM! This looks great. I love veggie frittatas! Very apprpopriate comparison! I have never thought of frittata this way lol! You have a lovely blog with beautiful recipes! Jenn, this looks so yummy. I love frittata. It's packed with flavor and super easy to make. Love all the fixin's you put into it. Love frittatas.... One can put almost anything in them and they're wonderful. So happy asparagus is in season again! Oh, gosh, I love everything in your fritatta! SO yummy, Jenn! salivating! oh my gosh this is amazing! 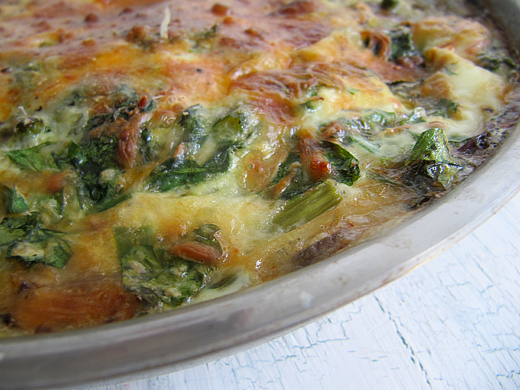 You've hit my hot button with this gorgeous frittata. Hungry now! This sounds so good, there's so many flavours going on. Great way to use up spinach...I always find I have some left! Love your description! You have a great sense of humor.